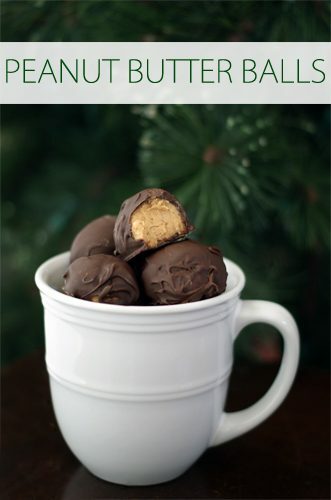 I used to make peanut butter balls as part of my regular Christmas baking but somewhere along the way, I got out of the habit. I always feel a bit like Lucy and Ethel in the classic candy factory episode of I Love Lucy when I make them, working as quickly as I can, getting chocolate on my fingers, etc.! However, the end result was well worth it, as my husband absolutely loved these, refusing to share them with anyone else in the family and comparing them to Reese’s Peanut Butter Cups. In a medium bowl, combine peanut butter, butter, salt and vanilla extract. Slowly add powdered sugar and blend well. Roll the peanut butter mixture into 1″ balls (time to pull out my favorite tool – the melon baller!). Place on a parchment-lined baking sheet and freeze for 30 minutes. Use two forks to roll the peanut butter balls in chocolate, completely coating them and letting the excess drip off before transferring them back to the parchment-lined sheet. Let harden completely before transferring to an air-tight container. Store in the fridge or freezer.